1 of 4 Stir together 1 tablespoon of the juice and the cornstarch. Set aside. In a small saucepan, combine the remaining juice, rum and brown sugar. Bring to a boil over medium-high heat and simmer for 10 minutes. Stir in cornstarch mixture and extracts. Cook another 2 minutes. Set sauce aside. 2 of 4 Cut pineapple into 8 slices, each about 3/4-inch thick. Cut pound cake into 8 slices, each about 1-inch thick. Heat gas grill to medium or prepare charcoal grill with medium-hot coals. 3 of 4 Brush pineapple with some of the rum sauce. Grill 5 minutes, turning once, until grill marks form. Set aside. Grill pound cake slices 2 minutes or until grill marks appear, turning once. 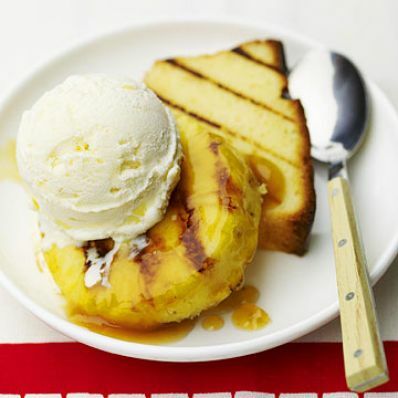 4 of 4 Serve pound cake slices, topped with grilled pineapple and a scoop of ice cream. Drizzle with remaining sauce.